My next post was going to be one about WordPress issues, but then something else came up. That post will still go live on Wednesday. Right now, I want to talk to you about content thieves and scrapers. We had a run-in with some content scrapers two years ago. That scraper took the content, but left the image links intact. At the time, I showed how to defeat that particular variety of scraper. This scraper, however, was trickier. It didn’t take long to deduce what was going on. BuzzMyFx is a server side scraper. Imagine someone coming to your site under normal circumstances. They tell their browser to load “www.MyWebSite.com”. The browser then contacts the server hosting your site asking for that page. The server gives the page to the browser which shows it to you. Simple, right? BuzzMyFx adds an extra layer. If you go to MyWebSite.BuzzMyFx.com, your browser goes to BuzzMyFx’s server first. BuzzMyFx’s server then contacts your server (as if it was a browser) for the page. Your server gives the page to the “BuzzMyFx browser” as it does to all other browsers requesting pages. BuzzMyFx then alters the page’s code to direct all links back to them. They also add in their own StatCounter script and change ad code to give them the revenue instead of the site owner. Finally, they give the changed version of the page to you. Pretty scummy, right? Of course, by doing this, they are committing massive copyright infringement at the very least. At $750 – $150,000 per infringement, dozens of infringements per site scraped, and possibly hundreds of thousands of sites affected, this could land them on the hook for millions of dollars. Then there are the problems encountered if they are using a trademarked logo/name without authorization. So how do you stop them? Thankfully, servers keep logs of every visit. As you loaded this up to read this post, my server dutifully recorded information such as your IP address, where you were referred from, the current date and time, and what page you were loading up. This happens at all websites you visit, but not all people know how to read the logs. As a webmaster, I am well versed in reading server logs. I loaded up their scraped version of my site while checking my server logs and there it was: 192.151.156.170. That was the IP address doing the scraping. Finally, I created a simple HTML page called “content-thief.html” with big, bold, red letters warning people that this was a scraped site and they should go to my real site. (I didn’t link to my real site since the link would be altered, so I just spelled it out.) You can go ahead and copy my “content-thief.html” page for your own usage. Just be sure to change the site name to your own. The other problem is that they can change their IP address which will let them bypass this rule. I can add their new IP address in, but it will be a constant effort to keep up with them. Perhaps the best remedy would be for all affected site owners to contact the people who run this “service.” Unfortunately, they’ve hidden who they are from WHOIS, but they can’t hide two things: 1) Their domain name is registered from eNom and 2) Their site is hosted by CloudFlare.com DataShack.net. If we can’t get them to stop, we can always get their hosting and domain name cut off. Here’s hoping this scraper menace ends soon so we can all get back to producing great content instead of trying to protect our content from being scraped. UPDATE: CloudFlare.com is denying being their host. As Heather commented below, they say they are a “reverse proxy, pass-through security service.” I’m guessing that BuzzMyFx is using CloudFlare to hide their server’s real IP address. However, the IP address I obtained that was seizing my content (192.151.156.170) isn’t “hidden” at all. That IP address comes from DataShack.net. So focus communication on them, not CloudFlare. UPDATE #2: If you aren’t technically inclined enough to know how to fiddle with htaccess and/or FTP files to your server, but you are using WordPress, you can also use the WP-Ban plugin to keep them off your site. This plugin lets you list IP addresses and even leave a specific message for those IP addresses to see. UPDATE #3: According to Lazy Budget Chef, even if you manage to contact BuzzMyFx, they will try to sell you a domain protection package to “steal the blogger’s legal right to their blog, their log in credentials, mailing list, and other personal information.” So even if you manage to contact these scrapers, don’t sign anything they give you! You shouldn’t need to sign some form of contract for them to cease scraping – they should just stop. Be very wary of these people. UPDATE #4: It looks like we’ve won this battle. BuzzMyFx seems to be down. They could still flee to another hosting provider (or even the same one signed up under a different account) and start their service back up. Even if they don’t come back, I’m sure other scrapers will take BuzzMyFx’s place. Still, you need to take each victory as it comes. Congratulations and thanks for helping take down this scraper, everyone! 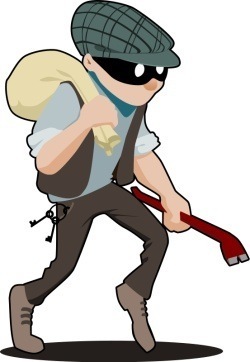 NOTE: The “burglar” image above is by tzunghaor and is available from OpenClipArt.org. My name is (FILL IN) and I am the President/Owner of (WEBSITE/BUSINESS). A website that your company hosts (according to WHOIS information) is infringing on at least one copyright owned by my company. Thanks. Everyone who had their content scraped should definitely file this DMCA report. URL(s) do not resolve to CloudFlare IP addresses. Please reply to this message, keeping the report identification number in the subject line intact, with the required information. That’s the response I got, as well. Thanks. I’ve updated my post. It looks like they’re using CloudFlare to hide their hosting, but the IP address that grabbed my site was from DataShack.net. CloudFlare is still serving the pages as cached snapshots as part of their service. These snapshots are from CloudFlare servers. I have a question – how do you know if your site has been scraped without going to that site? Unfortunately, there doesn’t seem to be a way. You could Google “site:YourBlogName.BuzzMyFx.com” but that’s not a guarantee. Right now “site:TechyDad.BuzzMyFx.com” shows no results, but my site was scraped. It seems the only way to be sure is to try going to YourBlogName.BuzzMyFx.com, but doing this causes your site to be scraped. B tried this with my blog. It first said “Site not found!” but soon afterwards showed my site fully. Thanks for sharing these details – I just found out that both of my blogs were scraped (and showed up before I checked) – I reported to the Google webmaster on each and will also work with my server to see what can be done. HOw do I create an html page? My site was scrapped so I’m working to figure this out asap! Go to http://www.TechyDad.com/content-thief.html and save that page locally. Next, open that page in Notepad and replace all references to “TechyDad” with your own site’s name. Save it an upload it. Alternatively, if you don’t know how to upload files/edit htaccess, but are using WordPress you can install the WP-Ban plugin ( http://wordpress.org/plugins/wp-ban/ ) to keep them off your site. Anyhoo, I did the WP-Ban thing too, and it isn’t showing the error or anything, just the scrapped site. So I don’t know if the WP-Ban plugin does this. Unfortunately, BuzzMyFx caches their pulled content. (If you go to the TechyDad dot buzzmyfx dot com page, you’ll see my site as it was last night.) I’m not sure how long they keep their cache for. The WP-Ban or HTAccess changes can’t stop them from using their cached content, but it can prevent them from grabbing new content. I’ve been hit and have just downloaded the WP-Ban as I’m not very techie and this is way over my head. What IP address, if any, do I add in or do I just leave it blank? As far as BuzzMyFx goes, you don’t need to do anything anymore as they’ve been shut down. In general, though, go in your WordPress admin panel to Settings->Ban. Enter the IPs you want to ban in the Banned IPs box and your message in the Banned Message box. Click Save Changes to save this. This is scary stuff! Doing the google search didn’t show anything for my site, thankfully, but of course, it could be scraped anyway and I seriously do not want to check! If and when this scraper gets the boot, is there anything that needs to be done to get sites working like normal, or will the code automatically revert when it’s no longer being redirected? They aren’t altering your actual site, but a copy that they are making of your site. Once they are shut down, the copies will go away. Your site won’t be affected at all (except that you won’t have to worry about them stealing your content). Ok..so our site has been taken as well. Can you explain the revenue issues a little more. That part is confusing to me. How are they stealing our revenue and how can we see that on our ads dashboards? Thanks so much! When they grab your content, they don’t just show it to the person who requested it. They change it first. One of those changes might be taking out your ad code and replacing it with their own. This way they get the ad revenue instead of you. Thank you so much for this very helpful information! My site’s been stolen as well. I found that their host is actually datashack. The best option I could find to report copyright infringement is to email the DCMA letter to: security@datashack.net, in addition to contacting enom. I hope you’ll update your post so everyone floods them with notices! Thanks. I’ve updated my post. Our site was stolen as well. I ended up sending a notice not only to Datashack, but their DNS prover as well – eNom (abuse@enom.com). Let’s hit this scraper with all we have everyone! Okay – so I found the range of IP addresses for Datashack – If I put them the in the WP-BAN plugin won’t that keep out innocent people? Here’s the notice I posted with the plugin. Site Scrapers Beware: You Are Banned from Our Website. If you’re not a site scraper and want to have access – please go to your service provider http://www.datashack.net and tell them your IP address is in the range of site scraper sites that they are hosting and you are being penalized. Want to update us or reach us – please mail us at …. Do we have a complete list of the IP addresses to ban? Or is it just that one listed in the article? I’m going to do the WP plugin but want to make sure I know all of the addresses to block. I pulled the whole range of their IP addresses for the hosting site from domaintools.com and posted with the caveat that all sites with that range are being penalized because of the scraper site. The problem is that DataShack is a hosting provider. They can be hosting legitimate sites as well as sites like BuzzMyFx. Hopefully, BuzzMyFx-style sites are a minority that fly under the radar for as long as they can before getting shut down. Meanwhile, people hosting legitimate sites might have issues connecting with your site for legitimate purposes simply because someone (that they’ve never heard of) on another server with the same host did something bad. Personally, I’d stick with the one IP address and add to it as needed to keep the collateral damage to a minimum. Understood which is why i have provided our email address to contact if they need to. I can’t imagine a legitimate site needing to connect with my site without me knowing? Personally – I think this puts more pressure on the organization that is allowing this scraped content to exist to take action. Is it just a good idea to post what you posted anyway even if we haven’t been scraped, to let people know in case we are? Or is that just a waste of time? Thank you so much for helping us and being patient with our ignorance. If you’re asking if it’s a good idea to spread the word: Of course. The more people who know, the better. I’d love it if some of the big sites grabbed like MSNBC or Babble found out. Let them unleash their legal departments on BuzzMyFx and pass the popcorn! But as an update looks like this site has been shut down…. for now HURRAY! Thank you so much for giving us all the info we need to help take care of this. While this is my first time on your site I WILL be back and bookmarking now. Thank you so much! As a totally non techy person with a stolen site, I am going to add the plug in. Thanks so much for sharing it. Don’t wanna bust anyone’s bubble but here’s another Scraper site that’s stealing just about EVERYON’S content. They look like they are hotlinking your photos (linking from their scraped version of your site to your site’s actual photos). Along with a DMCA notice, you can use the tactics I describe here http://www.techydad.com/2012/06/how-to-deal-with-a-content-thief/ to replace all their images with a “This site is a content thief” message. I’ve sent an email to my host asking them if they can please do this since I have no idea how to. I made the image and sent it to them. GREAT idea. I am so darned fed up. Thanks TechyDad. If you are not on shared hosting, it is far easier to just use firewall rules to block them. As an FYI, CloudFlare servers are still hosting a cached version of buzzmyfx.com. They can’t hide behind the excuse that they are not the hosting provider for these cached sites. Interesting. When I try to go to buzzmyfx.com (or any of the scraped sites that Google lists, I get an error. Only appears if you use www sub domain. Not sure if it works with others. Actually, I just looked again and now the cached subs appear to be offline as well.